Robert Watene Njenga has been a fighter for social justice since 2006. He’s courageously taken up public interest campaigns and demands for access to information. These are rights within the new Constitution—but demanding them is not something that many corrupt leaders appreciate. Njenga has filed several constitutional petitions under the framework of public interest litigations. One of them, filed in the High Court in Nakuru, was against the Subukia Constituency Development Fund which sought among other things a declaration that Subukia SCDF committee members are public officers under Article 260 of the Constitution and therefore that Subukia CDF be compelled to make information in their custody public. 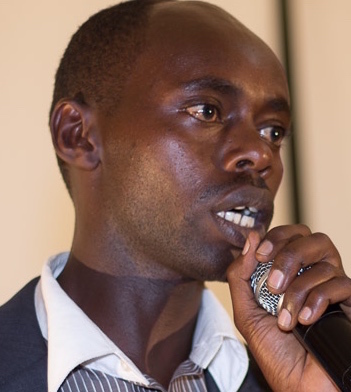 Njeri’s public interest litigation here exposed him to legal costs in the event he lost the case—but he won. In 2007/2008, Njenga was brave enough to participate in monitoring human rights violations before, during and after the election in order to ensure justice for the victims. He also took the responsibility of monitoring the work of the National Accord Commissions established to investigate both the elections process and post-election violence. Despite the challenges and risks he faces in this work, Njenga remains committed to fighting for social justice for all. Giraffe Heroes Kenya wishes to recognize Robert Watene Njenga for ‘sticking out his neck’ for the common good and his desire to lighten the loads, strengthen the hearts, and improve the lives of those in his circle of influence.